Let’s reflect on the goings on in France of these last few weeks. Can we call this an insurrection? The answer – of course - depends on what we mean by the word insurrection, yet whatever our understanding may be, something of the sort has taken place. And will probably continue. What tells us this is not so much the violent clashes that have occurred in Paris for the last two Saturdays. It is not the barricades or the cars burning on the streets of the city centre, or even the sporadic Jacqueries, or the road blocks stretching across the country. What tells us this is that two thirds of the population approve of the general movement provoked by the rise in petrol prices. And this approval has a far greater reach than any condemnation of disorder. In this respect it is interesting that in the behaviour of the fire and police officers we can observe hints of insubordination. There is undoubtedly in France a multitude that is rising up with violence against the new misery wrought by neoliberal reforms. A multitude that protests the reduction of the labour-force to the precariat and the constraints on civil life posed by insufficient public services. That protests the savage taxation of welfare services, the colossal cuts to municipal government finances, and now, increasingly, the effects (which are beginning to be calculated) of the Loi Travail. And it is now concerned about the next attacks to pensions and national education spending (universities and secondary schools). There is in France, therefore, something that is rising up with violence against this misery, and which is followed by the cry of “Macron, démission!” – it is an attack against the choices made by the banker Macron in favour of the ruling classes. The insurrection’s objectives are Macron and taxes. The movement that has grown from these demands is not, then, a traditional social movement – or at least it does not take the form traditional to the 20thcentury, where the movement presents its objectives for the institutions of the state to accept or refuse following a process of mediation via intermediary social bodies. This is a multitudinous movement, that does not want intermediation, that is the expression of the enormous social suffering so far accumulated. There is something particularly striking about this movement, that makes it different from the more intense struggles of recent years, the 2005 struggle of the inhabitants of the banlieues, for example. That struggle bore the mark of a liberation, this one has a desperate face. Not to mention ’68. In ’68 the student movement established itself on the foundations of a continuum of workers’ struggle. ’68 was 10 million industrial workers on strike, a storm that hit at the highest point of post-war reconstruction and development. Today’s situation is closed. To me, humble interpreter of great movements, it recalls the prison revolts more than the mass worker’s joy of sabotage. In any case, what we have here is an artificial movement, a contradictory movement, divided internally along territorial, generational and class lines, among many others; what unifies it is the refusal to negotiate, the refusal to take a chance on the existing political structures. It is without doubt an insurrection and for the moment its development is indecipherable. But the real obstacle to action lies elsewhere. Macron has dismantled all intermediary bodies and every direct relationship with the citizenry and cannot re-establish them. Indeed, it would not take much, if not to block the movement with whatever opportunistic, demagogic proposal, at least to mitigate its indignation (the force of which should not be underestimated): all it would take would be, as we have said, a return to the taxation of super-fortunes and a recuperation for redistribution of those four billion euros handed over to the bosses of the bosses, in place of the petrol tax. But it is not our job to advise Macron. Reputable sources rather insist, as we have said, on legal measures: on a state of emergency to put a stop to the struggles, accompanied by an “estates-general for taxation.” There is thus the admission that only force can put a stop to the struggles, and that only an opening towards fiscal reforms favouring the multitude can block their re-emergence. But it is precisely this solution that is impossible. So what now? We must wait and see what happens. 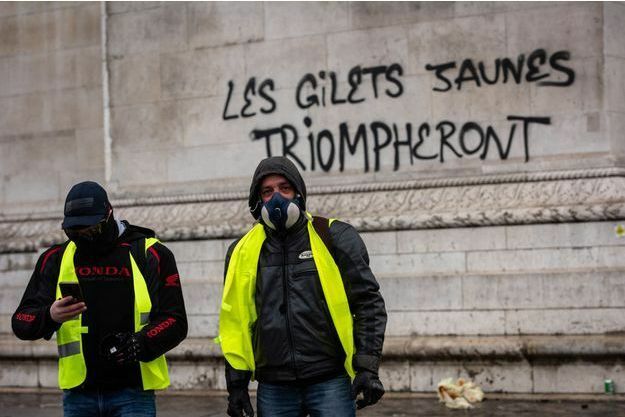 Whether there will be a fourth Saturday of mobilisations called by the gilets jaunes. But it is clear that we must continue to develop our reflections. Allow me, then, this ingenuous question: how can a multitude, characterised within insurrectionist movements, be diverted from moving rightward and transformed into a class, into a force with the power to transform social relations? My first reflection is this: if it is not transformed into an organisation, a multitude of this kind is neutralised by the political system, it becomes impotent. The same is true for its reduction to the Right, but also to the Left: it is only in its independence that this multitude can function. And then a second reflection: when we say organisation, we do not intend the party form – as if only the party-state were able to give organisation to the multitude. An autonomous multitude can function as a counter-power and, that is, as a vision able to weigh long and heavily on the “government of capital” to force it to concede new spaces and funds to the wellbeing of society. The organisational structure provided for by the democratic-American “constitution of parties” is struggling to cope with its incorporation into neoliberal politics. What is more, if there is no longer any possibility of the multitude coming to power, there is nevertheless the possibility of systematically keeping an insurrectionist movement open. This situation used to be described with the term “dual power”: power against power. The events in France tell us only one thing for sure: it is no longer possible to shut down this relationship. The “dual power” situation will stand and will endure for a long time to come, either latently or, as is the case now, in its express, manifest form. The task of the militants will therefore be to build new forms of solidarity around new objectives able to nourish the “counter-power.” This is the only way multitude can become the class.